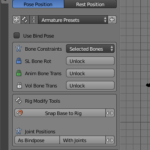 This panel provides a set of functions suitable for posing and animating the Avastar rig, and for Editing the Armature especially for working with Bind poses. Most parts of this panel are only available for Armatures in Pose mode or Edit mode. This page describes the common options in the panel. Further down you find the links to the Posing panel Subpages for the specific interaction modes. Click the (i) icon to open a popup window with detailed information about the pannel sections. The Rigtype can be Basic or Extended (Bento). 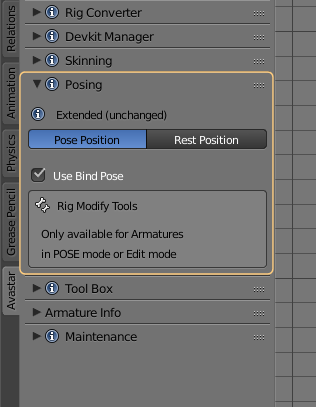 Select Rest Position to disable all pose information and display the rig in its neutral Restpose. 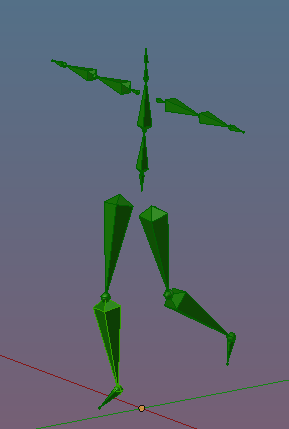 Select Pose Position to enable all pose bones and show the current pose. 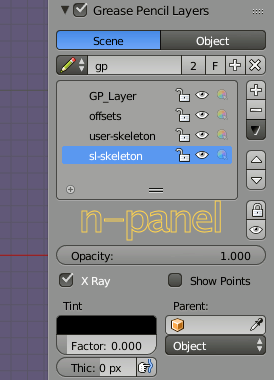 This is the same operator that you also can find in the Bone Data Properties Window (Right side of your Blender Screen). We added it here because it is a nice shortcut for quick tests of your Rig. This function is only available with Armatures. The option is greyed out when the active object is not an Armature. Sometimes you may want to conserve a specific Skeleton arrangement for later reuse. This is where Armature Presets step in. When you create a new Armature Preset then the rest position of the current Rig is recorded. This section is only visible in Experimental mode. 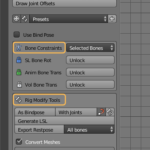 You can store complete Bone settings into Armature Presets. Note: This is an entirely experimental feature. It is not well tested and possibly does not work as you might expect. The main usage for this is when you want to use alternative bind poses for intermediate work, then later switch back to the original Skeleton arrangement. 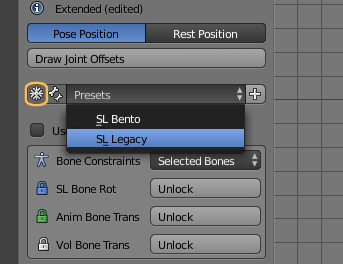 Tip: We have added 2 default Bone Presets for an Extended (Bento) T-Pose and a Basic (Legacy) T-Pose. But you are free to add your own Presets as shown briefly in the image. When this option is enabled, then Avastar calculates the difference between the restpose of the custom Rig and the restpose of the standard SL Rig. This difference is then exported to Collada as a “bind pose offset”. From the user point of view this is like you export your meshes “as if they where made in SL T-Pose”. Note: When you enable this option while you are not using the wehite stickman shape (appearance sliders) then you might see some bones shifting to slightly different locations. This is not a bug. this is how Secondlife functions. 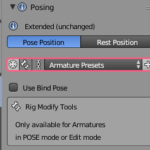 Also enabling this option does not change the Rig’s Joint positions! 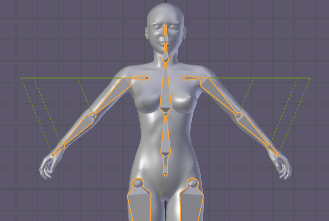 The benefit to use Bind Pose over just exporting the custom Rig with joints is: You can import the Rig into Secondlife without joint positions. Hence the restrictions on Sliders for custom rigs do not apply. Now you can work in your custom Restpose and there is nothing wrong with that. Avastar will automatically export your work compliant to SL. So there is nothing to worry about here. The only downside of using custom restposes is that you no longer can use the Avastar meshes as reference for your work! The technical reason for this is that the Avastar meshes are frozen during the restpose conversion, so they no longer are compatible to the default SL Avatar. Now you have a plain vanilla Avastar that you can use easily with the Fitting Panel. Why not use Alter to Restpose for this? In Avastar-1 you need to have the weighting already made before you apply the Alter to Restpose. In Avastar-2 you can bind unweighted meshes to your custom restpose, then add the weighting with the usual weight tools, and finally convert your meshes back to T Pose. The big(really big!) advantage of this approach is that you now have full control over the weighting, so you can get better results than before with much less effort. You think all of this is just “utterly complex stuff for easy things”? well, yes, admitted. it’s not a one button click solution. But honestly, once you understand how things work together it boils down to a few clicks and almost no thinking. You need to train a bit and then you will like this a lot, i am sure ! And note: All of the above is only needed when you want (or need) to compare your creations to the default SL Avatar (mostly when you work with fitted mesh). If you do not use the system character at all, then you can use the fitting panel with any skeleton arrangement.